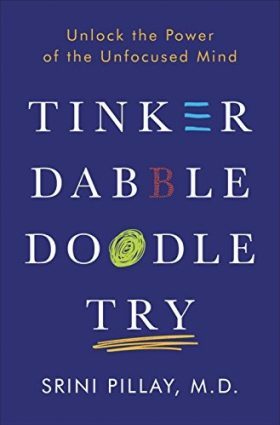 In his book, Tinker Dabble Doodle Try: Unlock the Power of the Unfocused Mind, Dr. Srini Pillay reminds us that often more focus is not the solution to achieving our goals. As a Harvard-trained and practicing psychiatrist, he lectures around the world on the power of the untrained mind. When I start a private consulting day, I often discover the inadequate amount of time doctors allow themselves for spontenous discovery. They are so focused on obtaining their goals in their business that they they are exhausted when they come home, leaving too litle time for exercise, dialogue, reading and allowing their minds to be unfocused. What free time remains is often spent watching television or thumbing through their smartphones, seemingly relaxing activities that often keep their minds focused on the business and on their goals at work. The mere suggestion that a client might take some time to be unfocused is frequently met with resistance. It sounds like I’m giving them permission to be lazy. Just the opposite is true. When you allow yourself some free time to think creatively, you open your mind to the possibility of new connections, seeing solutions in ways you would never discover sitting at your desk, forcing yourself to focus. Some of my best ideas to bottlenecks in the business have come to me while running around Mackinac Island in the rain, swimming in the ocean, sitting on my sailboat or while reading a great new novel. Take up drawing, painting or a new instrument. Allow yourself the time each morning or evening for adequate exercise. Get in the habit of writing down 10 new ideas every day, even if you think they are crazy, horrible ideas or both. Your brain doesn’t develop through constant focus on a small number of tasks. It develops through experiences and much broader connections. This is one of the many reasons I travel frequently and insist that my kids come with me on most trips. I want their brains exposed to a wide array of sights, sounds, tastes, settings and experiences. Telling professionals who are focused on something as micro-detailed as the millimeters and tenths of millimeters between teeth to go relax and schedule some unfocused time is a tall order. And yet, just because it doesn’t come naturally to us as orthodontists doesn’t mean it’s not exactly what we need.